Safety conscious homeowners always appreciated home security cameras. 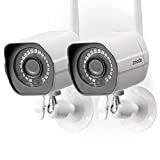 Today’s connected cameras allow you to connect to your security monitoring service. To make the best use of your security monitoring, you want to hide your cameras to prevent thieves from avoiding or disabling the camera. Try these tips to hide security cameras inside and outside. Sometimes you can disguise cameras within boring, bland everyday objects. This approach may work indoors or outdoors. You can also get creative and incorporate cameras within inexpensive decorative items. Be careful not to use an object that stands out too much as fake. Also, don’t hide a camera within something that looks like an object of value unless you want to “plant” a camera on the thief! The options are endless if you are looking for inspiration and a chuckle check out Popular Mechanics list of seven strange ways to hide a camera. Choose subtle places to hide your camera without disguising it. For example, you can hide a small camera within the branches of a lush house plant. Bookshelves are also great places to hide a small camera as it may blend in within your books and knick-knacks. A high, ceiling position is a great vantage point for your camera. Look for a subtle style that will blend in with your ceiling, windows, or molding. The camera may not be invisible, but it shouldn’t stand out either. Also, look for cameras designed to blend in or hide as it makes your job easier. Finally, pay attention to hiding or camouflaging any wires. A wireless camera may be easier to hide, but depending on your system it may or may not be the best option. Since most systems rely on sensors, also make sure these are hidden as well as possible. What About Visible Fake Security Cameras? You may ask, why hide security cameras? Don’t some people use fake security cameras as a deterrent? We previously commented that false security cameras may create more problems as they often look fake and sometimes even cause legal issues. Real security cameras are not necessarily a deterrent, but a valuable tool for your security monitoring service and law enforcement. A secure home, good lighting, and an alarm system are all effective deterrents. We encourage residents to place signs or stickers indicating a monitoring system on windows and other areas that thieves may notice. Your camera system is only as valuable as your monitoring system. Hidden cameras on their own have limited value, but when paired with round-the-clock monitoring they are highly effective. Contact Protect America for a free quote for a monitored home security plan that meets your needs.